Shirts With Random Triangles: Johnny Manziel is flying high on magazine cover. Faster than a speeding Sooner! More powerful than a Crimson Tide defensive line! Able to leap tall Razorbacks in a single bound! 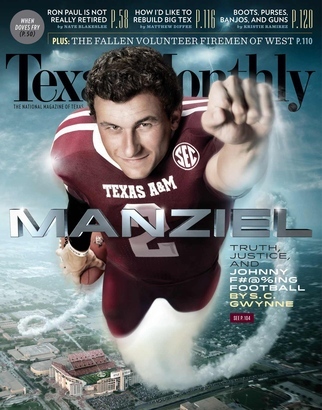 Yes, Texas A&M starting quarterback Johnny Manziel is flying off the cover of Texas Monthly. (What, you were expecting Tony Romo?) A controversy-filled offseason didn't stop the Texas publication from going the superhero route with Johnny F#@%ing Football for its September issue. Texas does not play by your silly rules, society, and neither will its heroes.